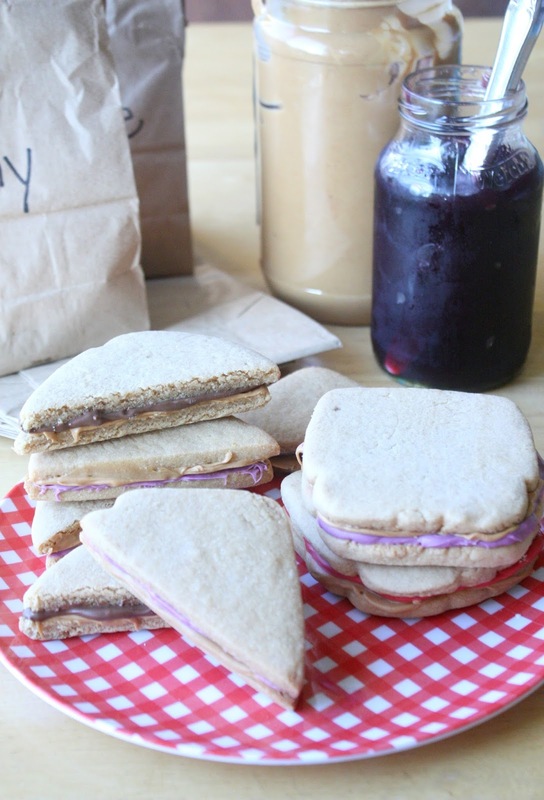 Peanut butter and jelly sandwiches are a classic, especially when it comes to kids and school lunches. I thought it would be fun to make a cookie version to celebrate the beginning of a new school year, which is in session on August 21 around here, three weeks from today! Some of the cookies were cut in half before baking, but I like the effect better by cutting the cookie in half after it bakes. The cut edge looks more like bread as you can see above in the peanut butter and "Nutella" sandwich. Since I will be shipping some of these cookies to my out-of-state munchkins I opted to use Wilton candy melts instead of actual jam/peanut butter/Nutella. The colors add a bit of whimsy. It was a plus that I already had purple, red, chocolate and peanut butter candy melts in my pantry:) I have one grandson that loves peanut butter & Nutella sandwiches which gave me the idea to add the chocolate melts:) The peanut butter candy melts give these cookies a big, yummy peanut butter boost and look very much like the real thing! 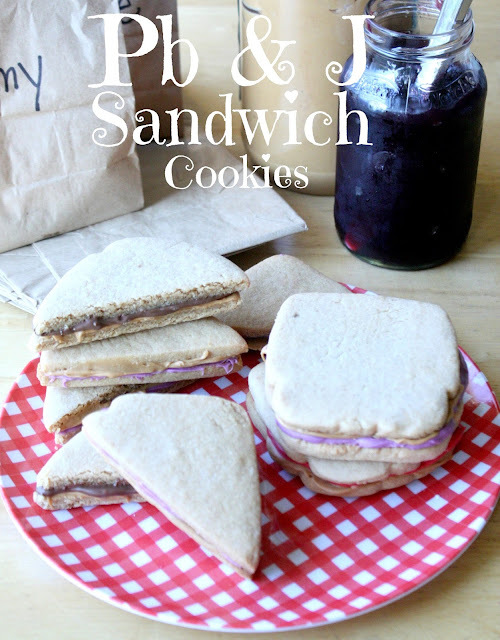 These PB & J sandwich cookies turned out soft, chewy and delicious! 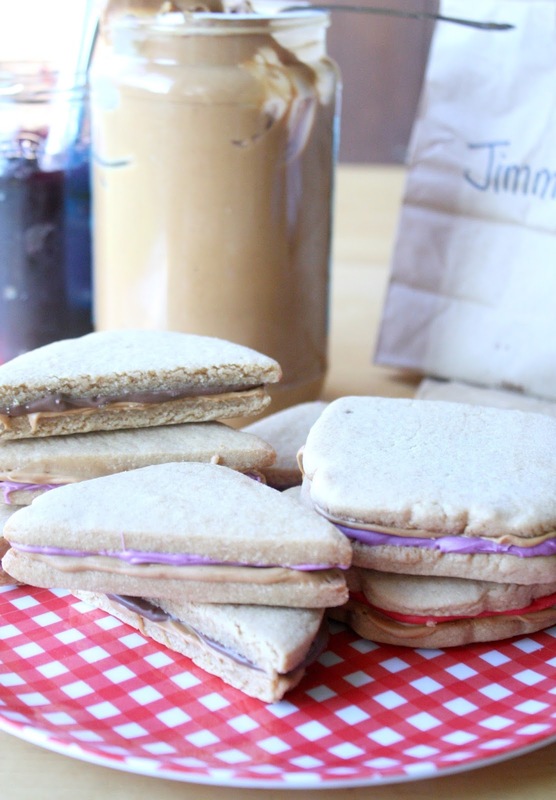 Pack some of these pb & j cookies in your child's lunch alongside a real pb & j sandwich and I'm sure they'll be a hit at the lunch table! Let dough chill a bit for easier handling. Sprinkle some flour on your work surface and roll out your dough to desired thickness (I rolled out to about 1/4-inch thick (thinner than usual) since each sandwich is two cookies in one). Bake cookies about 13 minutes. Melt the candy melts in the microwave according to package directions. Spread some of the peanut butter (or chocolate) melts on one slice of "bread" and the purple or red candy melts on another slice, trying to match size/shape of the two cookies. Gently place one on top of the other, melted sides together. Let dry completely. These are so cute! My boys would love to have peanut butter & jelly for breakfast, lunch, dinner, & definitely dessert! :) Cute idea! A classic combo, Sue. My husband will love these cookies too. I still love PB&J sandwiches and your cookies look great. Oh Sue, these are so cute - I really thought they were sandwiches!! Looks like real sandwiches!! Love PBJ!! Ohhh these look REALLY good! When my son was three I put together a construction party for him and I made something similar. So cute! These are so adorable. What better way to enjoy two great snacks: cookies and milk, and a PB&J. These are so cute! Perfect for a back to school treat. How smart with the candy melts instead of jam. Great thinking. They look pretty realistic. You are so creative. 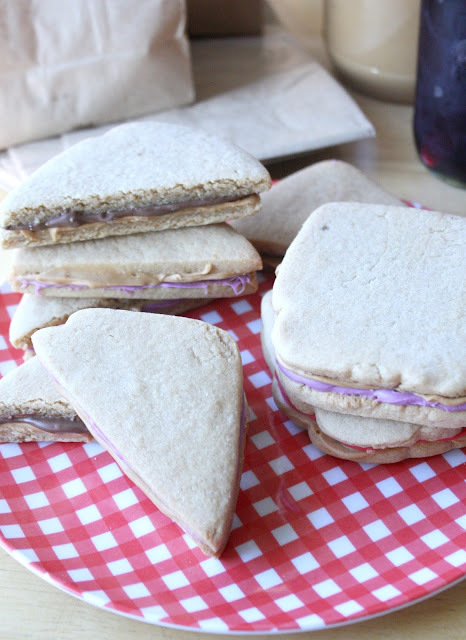 Yes, they look just like PB & J sandwiches...only better because these are cookies! :D My kids would go crazy about these. I love the sense of fun you add to your cookies, you must be very popular with your grandchildren. They are fantastic and so realistic. I'll have to try these with my boys. My oldest would love these - PB & J are her favorite! Such a cute idea! What a fun idea, my son will absolutely love these! Gosh, these sound good. I have to make them sometime!